The records in this list have been approved by the Book of Alternative Records. Information about new records (including ones in new, creative categories) are welcome (e-mail). WORLD RECORD "TALLEST STACK OF DICE"
Commercially available precision casino dice (edge length: 3/4 in) must be used for the attempt. The surface most not be modified in any way (sand finish is permissable). The opening of the dice cup must have a diameter such that it can include six dice in one layer. The dice cup must not be transparent and it must not have any aids inside. The attempt should be done on a mat measuring at most 60 cm x 40 cm. Movements of the dice cup to correct the positions of the dice are allowed as long as the cup has not yet been lifted. Once the dice cup has been lifted, it must not be in contact with the stacked dice in any way. After the dice cup has been removed completely, the dice stack must remain standing for at least five seconds. The stack must never be touched with the hand. The complete attempt should be documented on an uncut video. 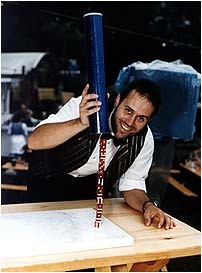 WORLD RECORD "TALLEST STACK (POINT-STACKING)"
Maximiliano Pugliese (Germany) staccked 32 dice (8 times 4) on the palm of his hand on 17 October 2013 at the set of the German TV Show "Die deutschen Meister".